Available at Amazon, iBookstore, Barnes & Noble, and O’Reilly Media. – Download Paddles game which implements the classic game of pong in 20 lines of code. – Download Air Hockey which demonstrates complex game logic, graphics, sounds, and computer AI. Chapter 2 – Download the Paddles resources which includes the pong sound effects. Chapter 3,5 – Download the Air Hockey resources which includes the graphics and sounds for Air Hockey. All Chapters – Download All ARC enabled code for all chapters in the book. The projects were all updated to work with Xcode 6 using Automatic Reference Counting (ARC). Now that this is the default for all new projects this is probably the best version to download. ARC is great because you no longer have to retain and release objects. This required enabling the project settings for ARC and removing any source code that referenced autorelease, release, retain, and dealloc. All Chapters – Download All code for all chapters in the book. The projects were all updated to work with Xcode 6 but do not have ARC enabled so the code will look the same as it’s written in the book. The changes were mainly to the project itself to support the latest Xcode and fix a few compiler warnings. The minimum iOS target was also set to 4.3. Chapter 1: Introduction to Xcode – Download the Game code which asks math questions. Chapter 2: Hello Pong – Download the Paddles code which implements the classic game of pong. Chapter 4: Physics – Download the Touches code which draws circles around multiple touches. Chapter 3-5: Graphics, Physics, Sounds – Download the AirHockey code which implements two player air hockey. Chapter 6: Computer AI – Download the AirHockey+AI code code which adds 3 levels of computer difficulty. I just bought the ebook. Normally complete project code is made available with these books. Do you have any plans on releasing completed code with project? The completed code is now posted above. Thanks for the reminder! I love your book so far, I’m only in chapter 2, but I’m a bit stuck with the paddle game. the error is that both instances for Start and Reset seem to be missing, but I typed them there. I’m also using the latest Xcode version (free license). I’d appreciate any and all help! thanks a lot! Moving the reset and start methods above the viewDidLoad method will make the compiler happy again. 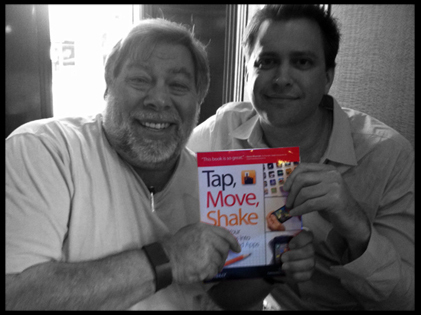 I just finished reading your book “Tap, Move, Shake”. It was a really good, quick, and fun introduction to iphone programming and using xcode. I purchased the kindle version so I could have it on my screen next to xcode as I worked through the chapters. I really like the way you guided the projects in a kind of evolutionary way and built on what was done previously in the book. Your book was a really good way to get my feet wet and get a feel for how things are done. I only skimmed over the last two chapters, but it looks like there’s some really good advice in there — I intend to go back and reread them when I finish my first app. Now I need to read something that goes deeper and has more details about objective-c, the ios sdk, best practices, memory management, etc. Btw, I’ve been a c++ developer for over 20 years. Do you have any good book recommendations? hi, please fix the 6th chapter source files, because when i click on the 6th chapter files i download files from 3-5chapter. Hi Todd, i bought your book. 😉 can you make tutorial without alerts ( tap the screen to play the game)? And game center wins count system? I’ve downloaded all the sources for the book above. Unfortunately, none execept the “touches” example will compile using xCode 4.02/Snow Leopard. Here you can see the errors for the AirHockey project. Do your sample files require xCode 4.2? What can I do that I don’t get compiler errors on xCode 4.02? Tech 411 is the bomb! I’ve turned all my friend onto your podcast with out little buddy Oscar. (I’m a serious listener of TMOS and wish you guys the best). CAN I impose enough to ask a geeky question? If not just say the word and I will start researching the old fashion way…….just thought I would ask. THANKS! What are you trying to do?? Capture Aussie Rules Football matches for later playback rather than wake up at 1:17 AM to watch a live event in Melbourne time. Incoming Sources: My high-speed internet bundle which gives me ESPN3 and AFL.LiveSportTV.au. Second is my Cox Cable TV subscription which gives me MhzNetworks which broadcast matches on their “world channel”. Question #1: Is there a difference between the signal coming in from high-speed internet and the signal coming in from a co-axial TV (HD Digital signal NOT analog signal) cable? Question #2: If so, is there a video card made that accepts two (2) inputs? Ethernet/wireless AND TV co-axial cable? Question #3: If so, is there a software program that tells the PC converted into a DVR, if you receive Ethernet/Wireless input record using this app. If you receive CATV input record using this app? Am I over thinking it?? Question #4: Is it worthwhile to get a video card with an “HDMI out” to plug into the 42” TV that would be above this magical DVR/PC. Am I over engineering it?? This PC’s ONLY function would be as a DVR. No OS, no spreadsheets, no nothing. Storage of recorded programs only. Question #5: What is the best software/application/approach to turn an old PC into a functioning DVR? I’m good for a $50 Paypal to you or a gift certificate to the restaurant/bar of your choice….trust me I UNDERSTAND that time is money!! Sorry I’m an idiot about DVR from old Dell PC question. Started reseaching and Monsoon Media’s Lava hold 6 to 8 hours and has MULTIPLE inputs / software based on your set up questions, cable provider, zip code, internet provider and gives you a custom “flicker-based menu” on you TV screen that you select just as with any DVR in the home. $199 direct from them (no shipping) or grab off the shelf at Best Buy, etc $199 off the shelf……………record and play back to you heart’s content. I apologize it you wasted the time reading BUT if you want to relate to 411 audience feel free !!!!! Best wishes again to you & Oscar!! I chose to try and do the first Paddles exercise with Storyboards and ARC. No problems until I need to call the Pause and Stop methods from the PaddlesAppDelegate. I’m guessing since the PaddlesViewController is loaded by the Storyboard, it’s not the same as being loaded in didFinishLaunchingWithOptions? Any ideas how I would do that? Thanks! i downloaded the source for chapter 6, i cant find the AI class inside, did i download the wrong 1? OK the link should be fixed now. There is a similar problem with the AI version. Strange thing is: my personal AI version works! Unfortunately, my 2 player version doesn’t. What’s the problem? Did you create the project with ARC disabled? When is the book going to be available on the UK iTunes? I’m surprised it isn’t. I’ll check on it. I have an app under development which is a folio of design and photography. I have wallpapers, twitter and flickr integration. To help get the app through the review process I want to put in a simple game (such as the air hockey one). You have some code in the implentation file. As the game I want to do would be a screen off of the home screen, would I still put the code into the implenation file? Sorry if this question makes no sense. This only started appearing after the alert message was put into the code to ask the user if they are ready to play. How do you get rid of the message? I did some searching on the web and found this answer and it worked for me. This delays the alert for a single pass through the runloop, presumably allowing your app’s controllers and storyboards to complete their setup before the alert is presented. Thanks for the info. Did you create your project with storyboards? I forgot to initially mention that I was using the iOS 5 simulator. Everything worked great! On to Graphics now! I finally made it to Chapter 3 Graphics. I was having trouble connecting the puck and the paddles to their respective property definitions. The scores were already connected from before. I am running XCode 4.2. But when I unconnected the first score and then tried to reconnect it, I couldn’t do it. So nothing happens when the game starts. I am able to ctrl-click and drag a line from the puck and paddles, to the property definition. Oh, I needed to manually bring up the ViewController.h file. It was not there automatically. Sometimes the assistant doesn’t automatically pull up the correct header but it’s easy enough to manually do it as you found out. If you command-click or right click on the game object (puck/paddles) you will be able to see what the object is connected to if anything. You can then make sure it is connected to the correct object in the header file. Just make sure the correct header file and XIB file are opened up and on screen at the same time. Yeah, I had to manually bring up the correct header. Some of my problem may have been due to the fact that I renamed the PaddlesViewController to AirHockeyViewController. I was able to see if the game object was connected to anything, but couldn’t make a connection. But it wasn’t a success right away. It still had issues. But I got it to work out. But first I had the paddles assigned to the wrong property and that was interesting. But I fixed that and all was fine. It was a good chapter. I had downloaded a trial version of Adobe Fireworks and was trying to go along with the chapter, but it was a little different for some reason. Oh well, I understood what needed to be done and it was helpful. I just finished Chapter 6. There were a few things that tripped me up. I had trouble on page 178. The new screen would not come up. I got a sigabrt in thread 1. While attaching the buttons, I had one of them assigned to a referencing outlet which wasn’t correct. Had to detach that. Not sure how that happened. I also had trouble on page 183. Got a sigabrt there too. The cause came from the page that had us add gameController to the AirHockeyAppDelegate.h file, we weren’t told to add a synthesize for the gameController in the AirHockeyAppDelegate.m file. Note that I use the name AirHockeyAppDelegate instead of PaddlesAppDelegate. Later on when we add debug, we need to add a synthesize for debug. Plus make sure we connect the debug label to the property definition for debug. I’ve bought the book a few days ago for Kindle and am struck in chapter one. I’m using Xcode 4.5 (4G182). 1) In GameViewController.m I’ve got vievDidLoad and didReceiveMemoryWarning, but no viewWillAppear, viewDidAppear, viewWillDisappear, viewDidDisappear and viewDidUnload. Is this because of newer Xcode version? I’ve added NSLog to the two I do have and just went on. 2) Making the connections for interface, I can’t select Action instead of Outlet in the popup for the submit button, the selection area is grey like in figure 1-19. The two other items worked, but in GameViewController.m there’s again no viedDidUnload, so I see no [self setLabel/Answer:nil]. 1. Just paste in the methods if they aren’t already included and everything should work fine. 2. Make sure you have a button selected and not a label. Check the Type on the popup. 3. Also make sure when you generate the project you did not select ARC (automatic reference count). All the book code was generated not using ARC. can you just look about it and tell me what i did false ? Feel free to ask any questions about the book here. Thanks! I’m in chapter 4 and looking back at the screen shot from ch3 fig 3-16 the “score” labels are in vertical orientation with relation to the top of the screen. After making changes to the app as described in ch4, building and running app the labels are still in the same orientation but in screen shot fig 4-2 the “score” labels are rotated 90 deg. I just got your book a week ago and am loving it so far! However, I’ve run into a problem I can’t seem to solve myself. In chapter 6 (computer AI) I had implemented the title screen and most of the AI states, but when I added the last state (AI_START) and put in the debug label at the top of my screen, it broke the game. Now when I select 1 player vs comp, it constantly resets the game, anywhere from every 2 seconds to multiple times per second. I added NSLogs to all the methods like reset and newGame etc, and none of them were being called except when they should be. I also wasn’t (intentionally) altering anything except what the book told me to, which was basically just the computerAI method in PaddlesViewController.m. I’m wondering if somehow I could have pressed a wrong button or clicked the wrong place while trying to drag in and position the new label in the nib file. I have tried deleting it and remaking it, and I’ve tried adding a breakpoint to the computerAI method so I can see exactly when the game is resetting itself (both paddles and the puck all get re-centered). It seemed that everything was running normally and then suddenly it got reset for no apparent reason. Hopefully you can give me some insight! Thanks in advance, and thanks for the great book! I’d double check your connections inside of interface builder with the Paddles. Make sure the variables for each paddle1 and paddle2 are not nil in the debugger. So what I’ve figured out after opening your code files is the Constraints in the .xib file – you didn’t have any and it ran fine. How do you add Views or Images without XCode adding Constraints? This causes a bias; this is certainly not perceptible for small numbers, but you don’t how your readers will use what they have learned. Maybe somebody will use arc4random() % ((2**32)-1 ) /3 . As you don’t mention that there is a bias, I suspect that may not be aware of it. arc4random_uniform() is recommended over constructions like “arc4random() % upper_bound” as it avoids “modulo bias” when the upper bound is not a power of two. Great book by the way, and have a nice day. I do have some problems with the coding for the Math game. Truly sorry to bother you, I bought your book last week. I’m a beginner of learning Obj-c, using Xcode version 5.1.1. Hope you can help me, much obliged. methods if they were deprecated? But after solving these problems, I clicked buttons (‘computer’ & ‘two player’) on simulator , it shows threads! Hello Todd,I brought your book,i am really happy that now i can program in Obj-C.
[self viewController (anOther method)] is not working on xCode 5.1. Can you help me with that case? Many thanks for your book! I bought it in Russia. This book has helped me to begin the exciting journey into the world of programming! On my site there Promotional codes. Congrats! Your graphics look great! You will write a book about OpenGL? You are very talented teacher! Your book is really great! I’m currently at chapter 2, trying to write Paddles for iOS 7 on Xcode 5. Most works fine, but I encountered an issue related to restarting after game is over and message box is shown: the puck position is restarted to random position on central line, but not moving. Second problem is when trying to call “pause” and “resume” methods from PaddlesAppDelegate. How can I reference ViewController methods in latest SDK? Hi WR– The problem here is the book was written when ARC was just coming out. In order to get the code examples to work with ARC you just need to remove any retain and releases. You’re welcome! Also I just published a download link above with all the projects in a single zip file that compile and run using Xcode 6.
i fixed the first problem but ran in to another on babe 86.
any help on what i can do to fix this would be greatly appreciated! Try downloading my updated code projects for the latest Xcode. The problem is the newly generated Xcode projects use different names. I’m wondering if it’s possible to switch the .xib to .storyboard in AirHockey? So it would be possible to create both iPhone size and iPad size of the project in Xcode 6.